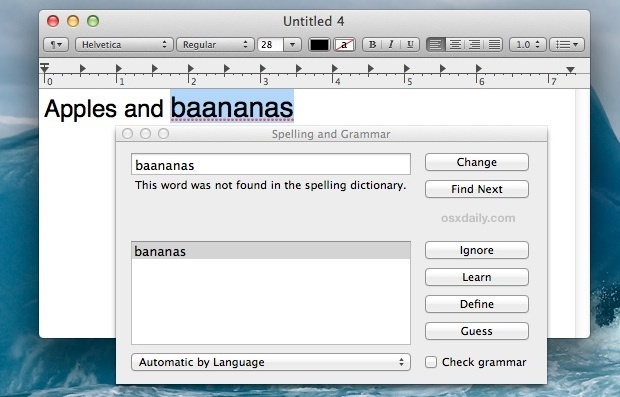 Mac OS X includes a powerful built-in spelling and grammar tool that runs automatically when you type in many apps, but a separate panel can be summoned from just about any text entry point or app that provides additional support for the feature. To bring up the “Spelling and Grammar” panel in a compatible Mac app, just use the keyboard shortcut Command+Shift+: (yes, colon/semi-colon). Once the Spelling and Grammar window is open, you can change words, skip to the next where an error has been found, ignore certain words, learn new words, define words, and even guess the appropriate word based on the current entry. To check grammar as well, be sure to check the box in the panel. The words that will be initially highlighted are the same that are underlined in red for typos, or underlined in green for improper grammar. For auto-corrected words, you’ll find them underlined in blue. This is a great tool to use when writing or editing and it can be used in conjunction with the automatic checkers as well. Or, if you use an app that doesn’t yet support the feature like Chrome or Firefox, you can always copy and paste the text to check from Chrome into an app like TextEdit, open the spelling/grammar checker, and then take it back to Chrome or Firefox. Though the panel also features a dictionary, individual definitions are easier to find by hovering over a word with the cursor and performing a three-fingered tap to define it. The shortcut is usually shown as ⌘: and not ⇧⌘:. ⌘: can be produced by different key combinations like ⇧⌘; or ⇧⌘. on different keyboard layouts. I wish someone would post a way to turn this autocorrection off globally. I have turned off spell check in mail and text and everywhere else and yet I find I will be typing and boom! there are either unwanted corrections already made or suggestions. The feature won’t default to “false”. The vast majority of the time this slows me way down and frankly I hate it. Hate it. Don’t need a machine writing “pistol” for “pistil” and such all day long. Did I mention I hate this feature? Merging iOS with ML can be very bad. There’s an option to disable autocorrect in the Language & Text preferences. You can also disable spell checking by default. See http://superuser.com/questions/367533/can-spell-checking-be-disabled-by-default-on-os-x. I don’t understand what is happening on your machine, I just typed a sentence including pistil and pistol into iText Express (Mountain Lion 10.8.2) and the spell check accepted them both. what app were you typing into? Bigasoft YouTube Downloader Pro for Mac updated to support the new Mac OS X Mountain Lion. It can fast download and convert YouTube on OS X Mountain Lion 10.8 for play YouTube video/audio on QuickTime/iTunes/iPad/iPhone/iPod Touch/iMovie/FCP and etc. Wish there was a way to use the keyboard to control the “add” “learn” and choose correcting words in that spell checker. I’m not confident using mac’s spelling and grammar checker. I prefer to use online grammar tools because they are more effective and fast. Given that I’m always connected to the internet.